I write these words as all of Israel prays and searches for the safe return of our boys, the three teen aged boys who were taken hostage on Thursday on their way home from school. 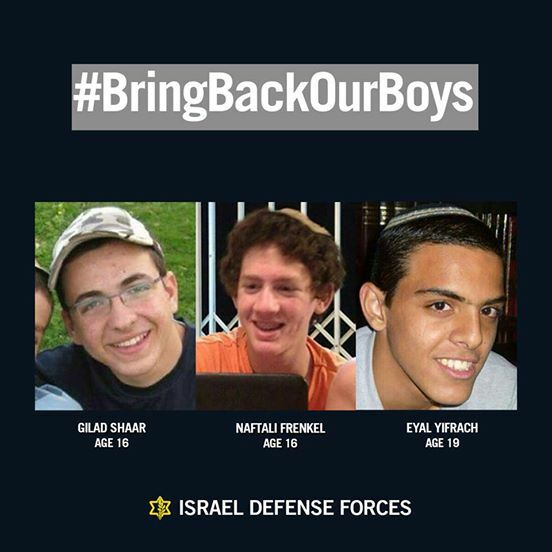 The entire nation is united in the prayers and the search for Gilad Shaar, Naftali Frenkel and Eyal Yifrach. And the enemy of Israel gloats and celebrates. They are handing out free candies, pastries and sweets all over the Arab occupied portions of Israel, they are celebrating a great victory. They know how we value human life and the price we are will to pay for it. We pray ...the guardian of Israel shall neither sleep nor rest. But the truth is that also the enemy of Israel neither sleeps nor rests. We the people of Israel seek peace. Today our Tour and Train group met with Bedouin Arabs, we rode their camels, we shared tea and we bought souvenirs. Our kind Bedouin friends also gave us many gifts and our members gave them gifts as well. This is how it should be, this is what we strive for. But too many of the Arabs in our midst are not this way. The enemy of Israel never sleeps and thus we must always, always, always, be on guard. The nations prays, the nation cries. Our kids, the kids I trained, now expert counter terrorists, are called up to search for the boys. Our training must never end. And I return to the same point...we must all train. We must all do what we can. We must never become complacent. We must never say...well, it has been a long time since the last attack so we can now rest. NEVER rest. I see many styles of Krav Maga out there. They are designed to dazzle and impress. I watch their technique and I wonder; Do they really think the average person can perform these techniques under pressure? Can the average police officer or soldier perform these when he is sent on a mission at 2 am? Really!! I have seen "military jujitsu", the same fancy stuff only the guys are wearing green. Who do you think you are fooling? Do you really think the average man, woman, police officer, is going to roll around with a terrorist and get him in a figure four lock? Get real! When my neighbor's kid is sent out at the crack of dawn and sent to Arab towns to search for the boys, in full gear, is he really expected to be able to do the techniques that these "masters" are showing on Youtube? Does anyone really stop to think that we are dealing with lives!! We train for reality because we train to live, to survive. We train to fight off the hitchhiker that wants to pull a teenager, boy or girl, into a car. We train so that ordinary wonderful people can live in peace. And we ask you to join our struggle. We ask you to be part of the solution and not part of the problem. I do not want to see your face on Facebook as the next victim. I do not want to be asked to pray for you. I ask you to join us now, fight back!